From our Chic Collection: You will absolutely love t with its warm amber and golden colors. 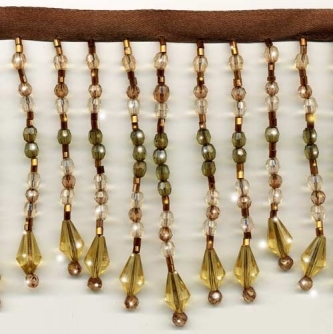 This Beaded Fringe has rich golden crystal clear faceted drop beads at the bottom, with smaller accent beads of ivory, amber and forest green. It is exquisite! . Each strand glistens with accents of copper bugle beads. Exceptional detail and craftsmanship with high quality crystal clear beads. It has a slightly variegated bottom edge with the longest strand at 3 1/4 " long, and an additional 3/8" rich brown satin ribbon.